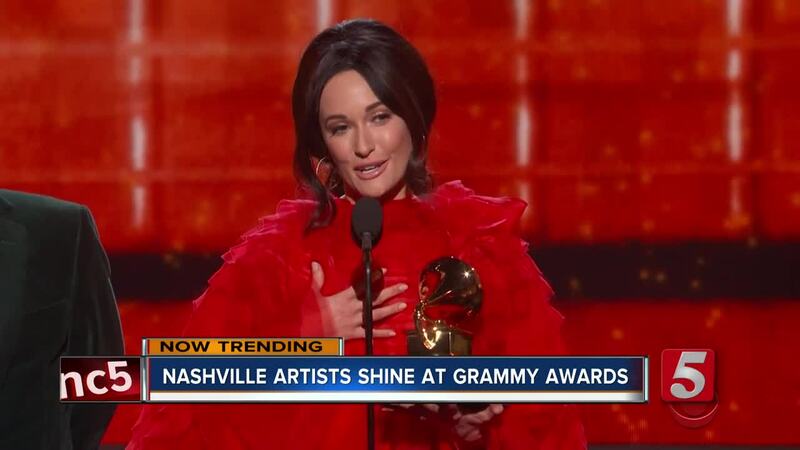 NASHVILLE, Tenn. (WTVF) — Some of Nashville’s brightest musicians gathered in Los Angeles over the weekend for the 61st Grammy Awards, and while they were there, artists won numerous awards and brought forward some great performances. Americana artist Brandi Carlile won her first Grammy Award after she was nominated for six awards. She took home three total, including Americana Album, American Roots Song, and American Roots Performance. Duo Dan + Shay won their first Grammy for Country Duo/Group Performance for their song “Tequila,” and when the award was announced, they were surrounded by a standing ovation from some of the other artists nominated in the category. “It’s the beautiful thing about Nashville and Country Music, we are all a family, we all root for each other,” Dan Smyers said during the duo’s acceptance speech. While numerous artists with Nashville ties took home awards, including Willie Nelson, the performances are where Nashville really took the spotlight. One of the biggest performances of the night was a tribute to Dolly Parton, who was awarded this year’s MusiCares Person of the Year. Parton was joined on stage by Kacey Musgraves, Katy Perry, Miley Cyrus, Maren Morris, and Little Big Town to perform a medley of Parton’s hits. Many said it was the first time they had heard the song, but that they became instant fans. Another performance that had Twitter and Facebook blowing up was Dan + Shay’s performance of their Grammy Award-winning song “Tequila,” where at the end of the song, Shay Mooney belted out a note that had everyone in the crowd stunned. Musgraves is set to play the Ryman at the end of the month, which will no doubt be one of the hottest tickets of the year.